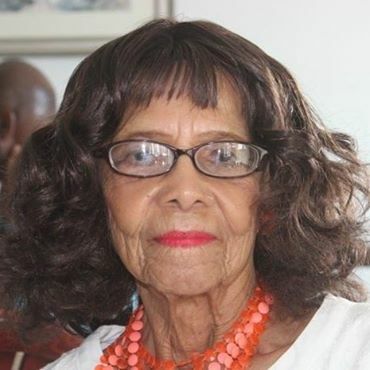 [By the family] Hundreds of Bermudians from all walks of life paid their last respects to Hamilton Parish icon, Mrs. Ruth Paynter, on Wednesday, March 14, 2018 at the Crawl Hill Gospel Church. Ruth Ilene Paynter, was born July 7, 1923, in Crawl, Hamilton Parish. She was the first of six children born of the union of the late Ilene Pearman [nee Furbert] and Harold Godfrey Hodgson. Her Aunts Millie and Annie were her first school teachers, teaching her reading, arithmetic, the Bible and home-care. She went on to attend the Berkeley Institute. As a high-school student she was re-born: she accepted the Lord Jesus Christ as her Savior through faith that He paid the price for her sins. She followed God’s instructions to be baptized shortly after at My Lord’s Bay with two of her sisters, Dr. Eva Hodgson and Damaris Smith [nee Hodgson]. She accepted the shared responsibility for three of her younger siblings on her mother’s unexpected early death when she was merely 18 years old.. She cared for each of them as if they were her own children. Arthur was two, Grace was six and Harold was 10 years old at the time. Her sisters Eva and Damaris were teenagers themselves. Whilst their father and aunts were able to encourage Eva and Damaris to continue to pursue their education making use of scholarships, Ruth was compelled to remain close to home to care for the remaining younger children. She began her teaching career after graduating from the Berkeley Institute at Temperance Hall, a one-room school for the children of Hamilton Parish. Once her sisters had completed their studies to become teachers, Ruth travelled to Toronto, Canada to attend Teacher’s College to complete her teachers training. She obtained money for her room and board while at school by working as a maid and nanny for the family who housed her. When the University of Maryland began to offer courses at the United States Air Force Base in Bermuda, she was the first Bermudian to earn her Bachelor of Arts degree. Ruth met her husband, Gerald T Paynter when she was13 years old as their mothers were close friends. Their love for each budded from that time, but they married on September 21st, 1950. She was 27 years old at the time. She had recently returned with her Teacher’s Certificate and was teaching at Elliot School in Devonshire. When they were courting her father clearly marked in red the 10 and the 6 on the wall-clock, to remind them that Gerald had to leave the house by 10:30 p.m.! Her commitment to her duties to her family -her father, brothers and sisters delayed any real possibilities of marriage earlier. They remained married for fifty-nine years, before he went on to his eternal rest. Ruth was hard-working from young, as her siblings recall. If there was a job to be done, she would do it. This was one of her primary life principals. She was ever active, and engaged from early morning to late at night. She was a Saver: she and Gerald would sacrifice and save, able to pay for large real-estate purchases without large borrowings most of her life. It was the manner that they were able to expand the humble start of “Clearview Suites And Villas and Landfall Restaurant from a bed and breakfast operation in a bedroom of their first home in Ferry Reach St. George’s to a 20-acre, multiple facility cottage colony. She enjoyed anything to do with houses and real estate, especially planning renovations and interior decorating. Very recently the business had suffered a setback but this does not detract from the years of success it enjoyed and the service it has provided to countless guests, friends, employees and members of the community of the years. Ruth never forgot to witness about God’s salvation available to us, in the midst of arranging for some business with someone. She may have even just met you and she would ask “are you saved?” If the person stuttered from shock of the pure direct question she would explain about Salvation. If they said yes, she would talk of God’s goodness and faithfulness. Known for her style and grace, Ruth Paynter was always from impeccably dressed. She never left home without her pearls and spike heels, even if she was just going to the grocery store. Those of us who are left behind mourn her passing can be comforted knowing that she is with the two Beings that brought her the greatest joy and peace: God, and Gerald [her love]. She said recently, “this has been the hardest 8 years of my life to be living here without Gerald”. She was one of the most courageous women of these times! Ruth leaves behind to celebrate her life, her loving daughter, Carollee [Otto], brother Arthur [Liris], sisters, Eva Hodgson and Grace Swan; grandchildren, Matthew and Juliana; nephews, Anthony Foster [Ella], Odinga and Jelani Hodgson; nieces, Angelita Dill [Edgar] and Maria Watkinson [Simon]: great nephews and nieces, numerous cousins, her church family, the staff at Clearview and Landfall Restaurant and numerous friends.